Eagle Eye advanced video surveillance cameras are named after the Eagle; a large bird of prey with a massive hooked bill and long broad wings, renowned for its keen sight and powerful soaring flight. Just like this amazing symbol of protection, the Eagle Eye Security Camera system was born to protect your home or business, and give a clear view from afar. Our residential security cameras for outdoor use are beyond most security cameras being sold today with features and options that you will want to explore. Just like the Eagle with freedom of movement, our cameras give you the ability to see your cctv view from anywhere with your smartphone or other internet capable device. "We love designing, manufacturing buying and selling security cameras of all types." Residential Security Cameras is our business. Due to our low prices and highly rated customer service, we stay very busy. We are here to serve your security camera needs, so please call us or email us with questions. We ship Eagles Eye Security Cameras nationwide to most every city in the U.S.A. including Canada for your convenience. If you are near us we have a technician that can easily install your residential security camera for a low cost as long as you have wifi which is the only real requirement to owning a wireless security camera system. 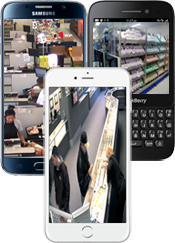 We can easily make your video surveillance system viewable on your smartphone within minutes. Motion detection with zone limiting and night vision included! Compatible with android, iphone, mac, pc, ipad view your cameras from anywhere. Copyright Eagle Eye Security Cameras. All Rights Reserved.